FROM GOODREADS – The Decameron (c.1351) is an entertaining series of one hundred stories written in the wake of the Black Death. The stories are told in a country villa outside the city of Florence by ten young noble men and women who are seeking to escape the ravages of the plague. Boccaccio’s skill as a dramatist is masterfully displayed in these vivid portraits of people from all stations in life, with plots that revel in a bewildering variety of human reactions. For the sake of full disclosure and transparency, this is a review of two-thirds of a book. I humbly admit that I raised the white flag of surrender at page 379. The finish line, page 655, was beyond the bounds of my stamina. Only twice in my life have I not read a book completely from cover to cover. The first was The Idiot by Dostoevsky – I was too young and didn’t understand it. The second – Catch 22 by Joseph Heller. Again, I was probably too young, although I found it boring and repetitive. Now there is a third entry on my list. 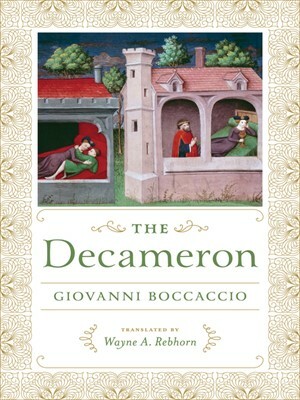 The Decameron, written in the fourteenth century by Italian literary master Giovanni Boccaccio, is a collection of one hundred stores, some comic, some tragic, some brutally violent, many sprinkled with eroticism, told over a ten-day period by a group of wealthy Florentines who have self-exiled in a castle to avoid the ravages of the plague. While the common people suffer and die, these aristocrats, along with their servants and maids, sing and dance, feast on the best food, drink the best wine, and amuse themselves with stories. It is a surreal environment and an early example of the noble one percent living lavishly while the ninety-nine percent struggle. Perhaps “noble” is the wrong word – many of the stories the aristocrats tell and enjoy to the fullest seem depraved by today’s standards. Women are objects to be stolen and ravaged. Men are lusting brutes. In an extreme example, the seventh story on Day Two, a young, beautiful girl is abducted and sexually assaulted repeatedly by several different men. Yet, despite the initial pain and humiliation, she supposedly “became so happy that her beauty flourished”. By the story’s end, she had “lain with eight men maybe ten thousand times”. Even children are not immune from the risk of barbarity. After two young unmarried lovers have a child, the families, claiming extreme humiliation, want to “take that little boy…and smash his head against a wall and throw him out for the dogs to eat”. The lovers were sentenced to death, “to be burnt alive , as they richly deserved”. Ultimately honour is restored before any of this can happen. The child and his parents are saved, the story ends happily, and the nobles celebrate with food and drink and dance once again. Throughout Decameron, deception abounds. Husbands cheat on their wives, wives cheat on their husbands, and the potential ramifications of their behaviour don’t seem to matter. When an illicit liaison is successful, the story ends with “May God grant us the same enjoyment”. The belief is that “there is no shame or loss of honour unless the fault is evident”. Even the clergy are “almost all engaged in the sin of lust”. When the abbot of a monastery becomes aroused by a peasant girl, he tricks her into meeting with him so he can fulfill his desires. He “placed her on top of him and, for a long time he sported with her”. Once satisfied, he could go back to running hs church and praising his God. Day six, story six. With my mind filled with more than enough debauchery, I closed Decameron for good. It may be considered a classic, it has definitely been influential for generations, but my life will not be any more enriched by trudging through four more days of twisted tales. 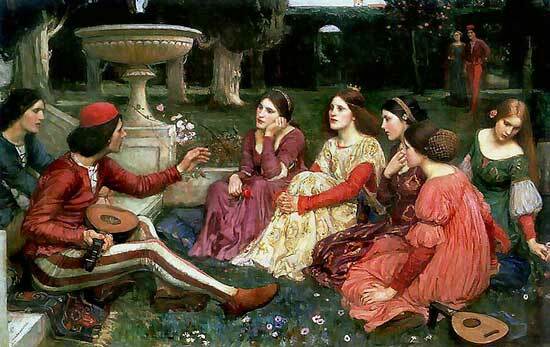 Giovanni Boccaccio (1313 – 21 December 1375) was an Italian author and poet, a friend and correspondent of Petrarch, and an important Renaissance humanist in his own right and author of a number of notable works including the Decameron, On Famous Women, and his poetry in the Italian vernacular. 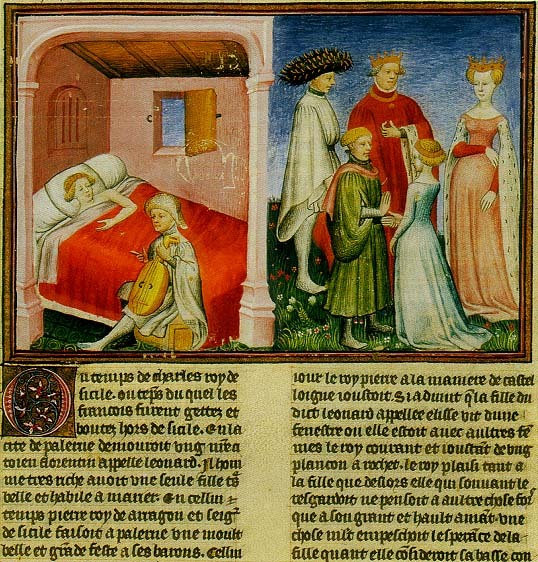 Boccaccio is particularly notable for his dialogue, of which it has been said that it surpasses in verisimilitude that of just about all of his contemporaries, since they were medieval writers and often followed formulaic models for character and plot.